Lewis Shambourg Peverelle was born 26 Apr 1893 or 26 Apr 1894. He was the son of Lewis Henry Peverelle and Julia Ann Doyle. The first record I have found for him is the 1901 Census of Canada. 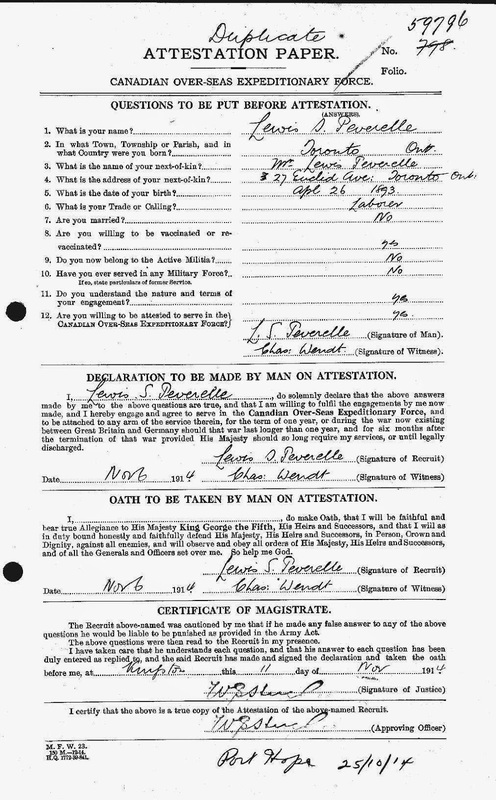 As you can see, the census indicated that he was born 26 Apr 1894 in Ontario. At the time of the 1901 census he was the 2nd of 4 children, and the eldest son. In this census, he is called Shamburg. The 1911 census he is also called Shambourg, and he is listed as born in Apr 1894. 2. In what Town, Township or Parish, and in what Country were you born? Toronto, Ontario. 4. What is the address of your next-of-kin? 27 Euclid Ave, Toronto, Ont. 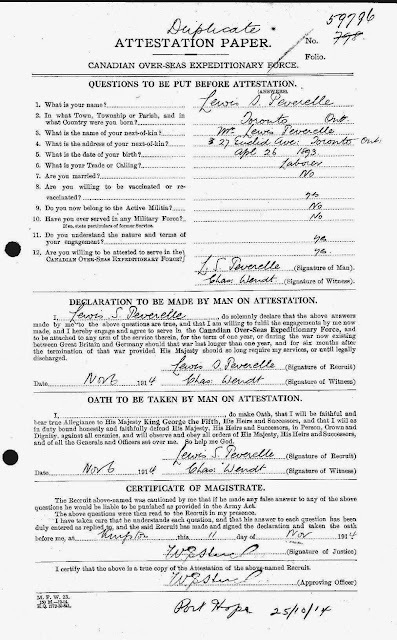 The page was signed by the Lewis on 6 Nov 1914 and by the Magistrate on 11th Nov 1914. The second page is a Description of Lewis Peverelle on Enlistment. His apparent age was 21 years, 7 months. His height was given as 5 ft, 3 ins. The 21st Battalion had a goat named Nan for a mascot. A full story on her can be read here. 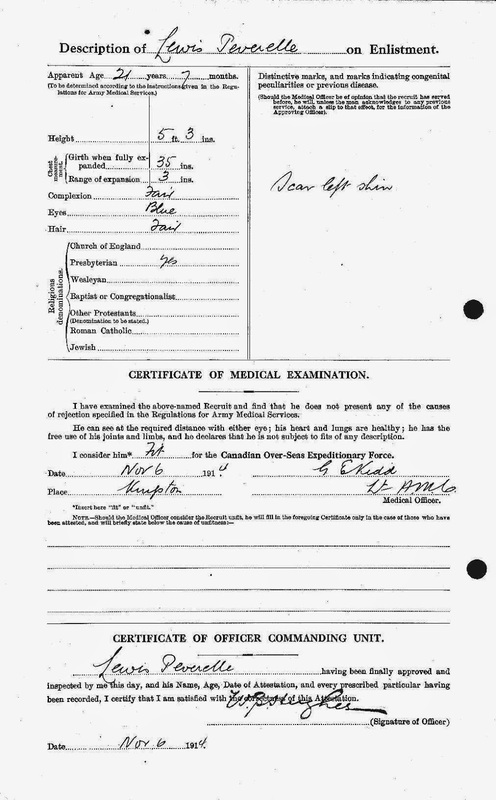 According to the Canada, War Graves Registers (Circumstances of Casualty(, 1914-1948 for Lewis S Peverelle he was killed in action on Jun 24, 1916 at the "TRENCHES AT THE BLUFF, YPRES" The # is given as 59796 which is the same as his Attestation Paper. He was buried at Bedford House Cemetery, in Zillebeke, Belgium. There is a photo here of the original wooden crosses that marked the graves before the Commonwealth War Graves Commission put in the markers. I really wish I had an actual photograph of Lewis to see what he looked like. **Update May 19th, 2015. I know have an actual photograph of Lewis! Due to the free Toronto Star archives offer, I was able to pull the newspaper article listing his death. Toronto Star archives, Jul 12, 1916, Pte. Peverelle Killled. viewed by Kris Stewart May 18th, 2015. I am super excited to have a picture, even a not so great one, of Lewis S. Peverelle. He looks so young to me! I am still pondering the article. It states that "His great-grandfather was in Wellington's army at Waterloss." I assume they may have ment Waterloo? The article further states that his grandfather fought in the Crimean War. Furthermore, the article states that "His father, Lewis Peverelle, though he was quite young at the time, was in Paris when the victorious German army entered in 1871, and his grandfather was with the French troops at Sedan. 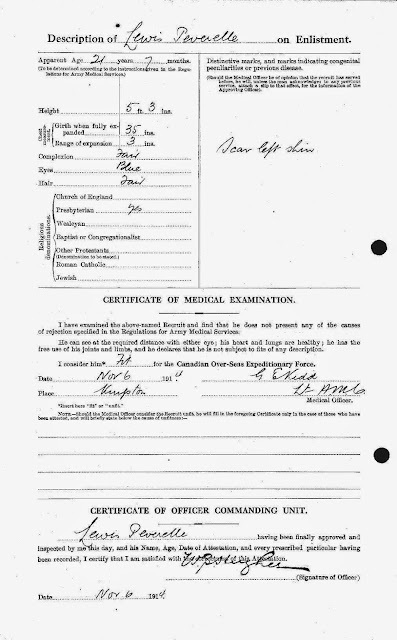 After his father reached manhood he was appointed lieutenant in the famous Chasseurs d'Afrique Regiment, resigning his commission to come to this country, where he lived in Toronto for many years. Another son, Pte. Oswald Peverelle, is also at the front." Hmmm...lets look at each piece of this. His father was indeed Lewis Peverelle. Lewis Henry Peverelle, his father, was born in 1865 so he would indeed have been quite young in 1871, about age 6. But I have no record of him being in Paris....ever. I did a bit of quick background reading http://en.wikipedia.org/wiki/Siege_of_Paris_%281870%E2%80%9371%29 which seems to say that this was very early in 1871, but the Franco-Prussian War was between France and Germany. with England not playing a part that I could see. By 1890 Lewis Henry is in Toronto by 25 Oct 1890 when he married Julia Ann Doyle. I have so far been unable to locate an immigration record, but the 1911 census indicates he immigrated to Canada in 1882. So far I have not located him in the 1881 census of England or Canada. 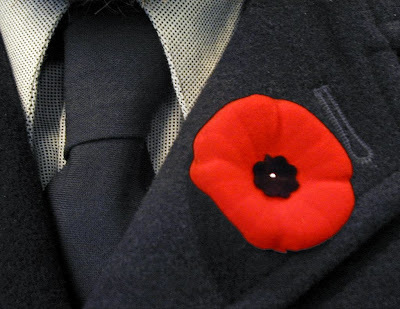 Images credit: Poppy on lapel: Skeezix1000 under Creative Commons license.